Lunafreya Nox Fleuret is more than just a double-sided trident wielding warrior. As the main heroine of Final Fantasy XV, she has the profane ability to always put others first, no matter what the results may yield. As an oracle, she has the power to heal all of Eos from the light fading plague Starscourge. As a symbol, she now sits proudly across our client Casey’s neck, serving as her guidepost. 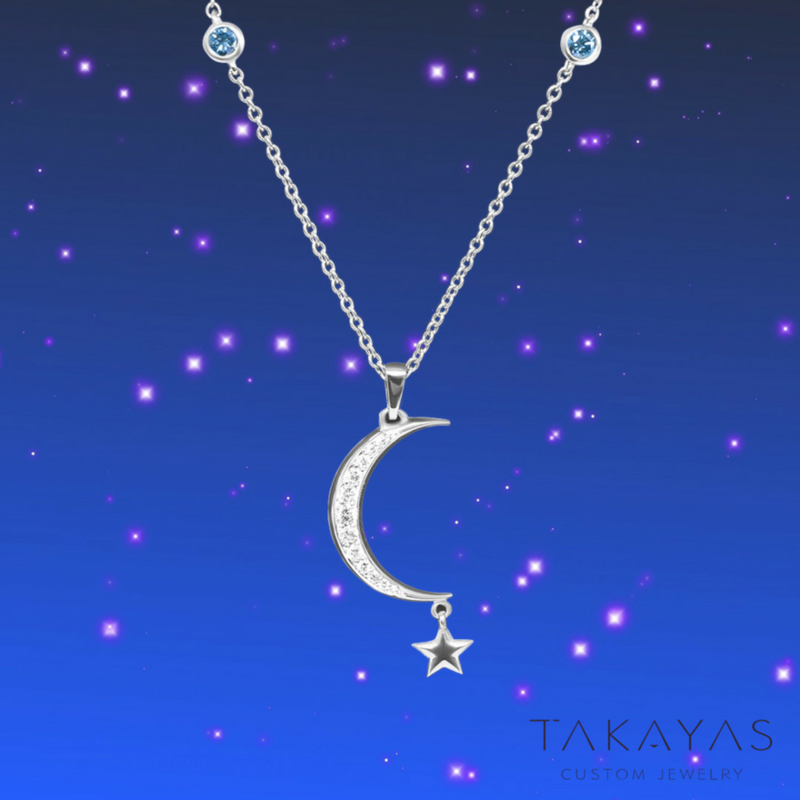 Takayas sought to celebrate Freya’s character in the series, and in addition, wanted to challenge the idea of the typical crescent moon necklace. Instead of having the back side crafted to match the front, he tapered it to create a ‘knife’s edge’ finish. This shape creates sophistication, elegance, and artistic depth that is more aesthetically appealing than mass-produced crescent moon pendants, which are simply duplicated on both sides. In order to subtly pay homage to Freya's blue flowers, Takayas used blue diamonds in a bezel setting. In her prolific speech, Lunafreya declares: “On my honor as oracle, I will not rest until the darkness is banished from our world and the Light is restored.” A supreme undertaking; but when we enter Freya's mindset, it seems not only accomplishable, but perfectly natural. Love is a similar covenant, one we may never grasp the enormity of. But when we see our significant other across the room, down on one knee, or at the other end of the aisle, we realize it's more than possible; it's destiny.